“…his fall 1979 concerts. “What Can I Do For You?”, “Solid Rock”, “Saving Grace”, “Covenant Woman” and “In The Garden” as performed at these shows are some of the finest work in Dylan’s oeuvre, but you’d never know that from listening to “Saved”, the 1980 studio album that features these compositions. 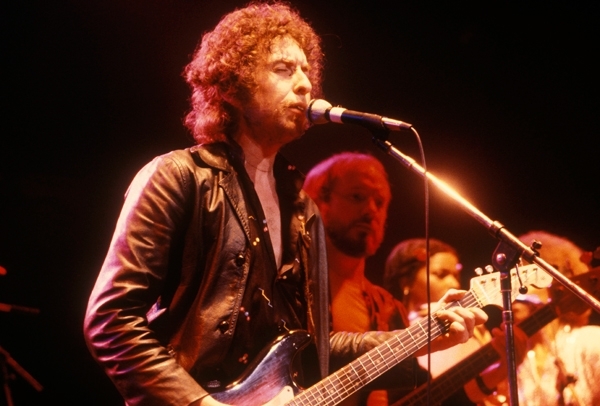 …….you’re awareness and appreciation of Dylan’s greatness is incomplete until you hear these songs (and “When He Returns”) as performed live in the fall of 1979.. The November shows @ Warfield in 1979 are by many fans (& collectors) considered to be the highlight of the “Gospel Tours”. Nov 6,7,11 & 16 are the shows I’ve been listening to…. and Nov 16 is my personal favorite. It is an amazing concert… … it’s actually one of my absolute fav Dylan concerts, top 10 for sure. Thank you. You know we read in the newspaper every day, what a horrible situation this world is in. Now God chooses the foolish things in this world to confound the wise. Anyway, we know this world is going to be destroyed, we know that. Christ will set up his kingdom in Jerusalem for a thousand years where the lion will lie down with the lamb. Have you heard that before? [applause] Have you heard that before? [applause] I’m just curious to know, how many believe that? [more applause] All right. This is called “Slow Train Coming”. It’s been coming a long time and it’s picking up speed. Thank you. You know, I really want to thank all you people for all the letters and all the cards and all the encouragement. It’s very kind. [audience: “God loves you Bobby!”] He loves you too, don’t you forget it. All right, this is called, well this is a song we been working in on. And we hope to record sometime. Maybe it’ll be out uh– they hold my records so long you know . . . You might hear it, in a month from now, maybe a year from now, but remember whenever you do remember you heard it first right here. I tell you San Francisco is a great town. We know that there’re a lot of things wrong with it, but we, there are a lot of people here that we love. And we’re gonna miss it too. Anyway, this is called “Hanging On To A Solid Rock, Made Before The Foundation Of The World”. That’s right. You know, Satan’s called the God of this world, that’s true, and it’s such a wonderful feeling when you’ve been delivered from that. On the keyboards tonight, give him a warm hand, Spooner Oldham. On the other set of keyboards, Terry Young. On the lead guitar, Fred Tackett. On …, playing the drums tonight, Jim Keltner. And on bass guitar, Tim Drummond. Singing on the bottom tonight is Helena Springs. Singing in the middle is Regina McCreary. Singing on top is Mona Lisa Young. I’ll say it again, it’s just like, we’ve been here a while now, it does feel just like the first night however. I wish we could stay longer, but we can’t, we got to go. So we want to give all praise and glory to God tonight. Ain’t nobody down here deserve any. All right. I wish there was an edit option. I apologize for my errors. But did you live his preaching too? His rant-driven, bile-filled preaching? I also admire Dylan’s vocal passion during the first phase of the Christian period, but when you did a quarter of an inch beneath the surface you find a man who had read and was influenced by … The Late Great Planet Earth! … and I was reading it too, but I was only 16 years old (it was a Best Seller after all), and I certainly got over it. “Solid Rock” – one of my favorite Dylan reborn Christian compositions – absolutely explodes in the version posted here. Man does it rock!! !